In the previous blog, we talked about some of the emerging trends in the mobile application development industry. It is very evident from the previous blog that mobile apps have a bright future as these are being used by a large scale of people around the globe for fulfilling their diversified daily needs. Be it technical trends or advanced features, quality always comes first regardless of what type of app it is. But in order to maintain the quality parameter in future apps it is important to analyze them carefully to decide which would go best with our requirements. 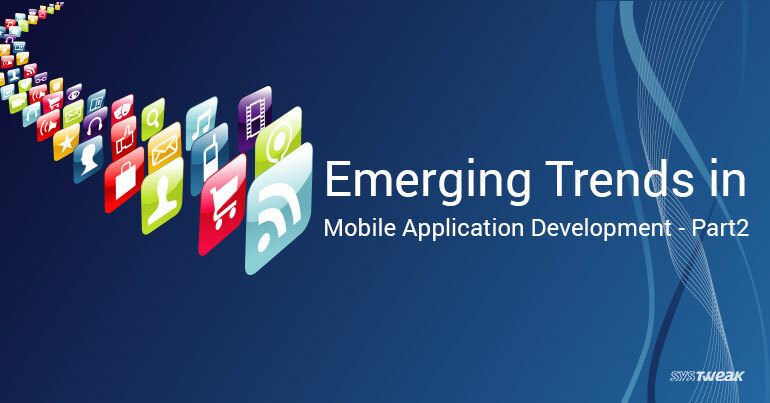 In this blog, we would be discussing about some more emerging mobile application development trends. API which stands for Application Interface is latest trend in the software development of not only the mobile application but on all the platforms. By imbibing the API techniques on any software architecture makes the software flexible and compatible across all types of platforms. APIs trend has come as a boon to the mobile application developers as with this the development work on the mobile application is reduced. The same application interface could be used for all versions of applications whether Android OS, iOS and Windows OS. It is among the hottest mobile app trends which enables developers to leverage a large catalog of JSON/REST APIs, which takes care of a lot of backend work such as data storage, retrieving information and much more. We all know that technocrats are now developing home systems with internet connectivity and also that major security threats at present are posed by internet. Since, most mobile apps require internet connection, security remains a major concern and challenge for app developers. Many of the apps on the play store have already been hacked once and the scenario is pretty similar for iOS store as well. Therefore, Smartphone and internet security have become big targets for all IT giants for the coming few years. Hence, developers and software architecture designers have cyber security as the major feature in their development tasks. We already discussed in the previous blog on how advancements in Cloud technology is enhancing the developments in the mobile application. One of the popular category of mobile app from among all the varieties available in the market is Gaming Apps. Games are one of the main reasons for growth of smartphones among the youth. The latest shift in the trend of mobile gaming industry is from single player to multiple players. Developers are now focusing on new-generation games which are based on integrating multiple players, latest game engines and also have access to the cloud technology. These new trends can also push the enhancements in the UX design. Altered Reality is the new reality trend of the Mobile Industry. The most recent best example of it to which everyone of us would be able to connect to is Pokemon Go. Then again, we have a wide variety of AR and VR glasses. After the success of the Pokemon Go and other AR and VR games, mobile app developers are planning to experiment more with this technology trend beyond gaming apps. Some of the research being done is in the medical and education related applications. This field has incorporated several domains of technology industries. If we talk about its integration in the mobile application development “Machine Learning” is the aspect of Artificial Intelligence which will have a major role to play in it. Machine learning consists of algorithms that can help you process data, learn from it and make decisions and predictions related to certain tasks. Artificial Intelligence trend will be a part of construction techniques of mobile apps and will also be a part of the program which boost the capabilities of the app. AMP stands for Accelerated Mobile Pages. So, we need to say thanks to this technique that the pages of our mobile apps load so much faster. This is an open source technique which helps in the fast loading and functioning of the mobile apps. Technologies in the Mobile market is advancing continuously with each passing day and the great industry giants are promising more innovative technologies. When we talk about mobile application development industry, developers cannot afford to rely on outdated tools and technologies. Hence, it is very important for them to stay updated with the latest trends in mobile application development. Subscribe to our newsletter to receive the upcoming blogs in your inbox.